The QtXmlPatterns module supports using XQuery 1.0 and XPath 2.0 in Qt applications, for querying XML data and for querying non-XML data that can be modeled to look like XML. The QtXmlPatterns module is included in the Qt Full Framework Edition, and the Qt Open Source Edition. Readers who are not familiar with the XQuery/XPath language can read A Short Path to XQuery for a brief introduction. Conformance to standards: Conformance to all applicable XML and XQuery standards ensures that QtXmlPatterns can always process XML documents generated by other conformant applications, and that XML documents created with QtXmlPatterns can be processed by other conformant applications. Maximal flexibility The QtXmlPatterns module can be used to query XML data and non-XML data that can be modeled to look like XML. There are two ways QtXmlPatterns can be used to evaluate queries. You can run the query engine in your Qt application using the QtXmlPatterns C++ API, or you can run the query engine from the command line using Qt's xmlpatterns command line utility. Note: If you compile Qt yourself, the QtXmlPatterns module will not be built if exceptions are disabled, or if you compile Qt with a compiler that doesn't support member templates, e.g., MSVC 6. See the QXmlQuery documentation for more information about the QtXmlPatterns C++ API. Although the XQuery language was designed for querying XML, with QtXmlPatterns one can use XQuery for querying any data that can be modeled to look like XML. Non-XML data is modeled to look like XML by loading it into a custom subclass of QAbstractXmlNodeModel, where it is then presented to the QtXmlPatterns XQuery engine via the same API the XQuery engine uses for querying XML. When QtXmlPatterns loads and queries XML files and produces XML output, it can always load the XML data into its default XML node model, where it can be traversed efficiently. The XQuery below traverses the product orders found in the XML file myOrders.xml to find all the skin care product orders and output them ordered by shipping date. Without QtXmlPatterns, there is no simple way to solve this kind of problem. You might do it by writing a C++ program to traverse the file system, sniff out all the XML files, and submit each one to an XML parser to test that it contains valid XML. The C++ code required to write that program will probably be more complex than the C++ code required to subclass QAbstractXmlNodeModel, but even if the two are comparable, your custom C++ program can be used only for that one task, while your custom XML node model can be used by any XQuery that must navigate the file system. With QtXmlPatterns, subclassing QAbstractXmlNodeModel eliminates the transformation required to convert the non-XML data model to the XML data model, because there is only ever one data model required. The non-XML data model presents the non-XML data to the query engine via the XML data model API. Also, since the query engine uses the API to access the QAbstractXmlNodeModel, the data model subclass can construct the elements, attributes and other data on demand, responding to the query's specific requests. This can greatly improve efficiency, because it means the entire model might not have to be built. For example, in the file system model above, it is not necessary to build an instance for a whole XML file representing the whole file system. Instead nodes are created on demand, which also likely is a small subset of the file system. 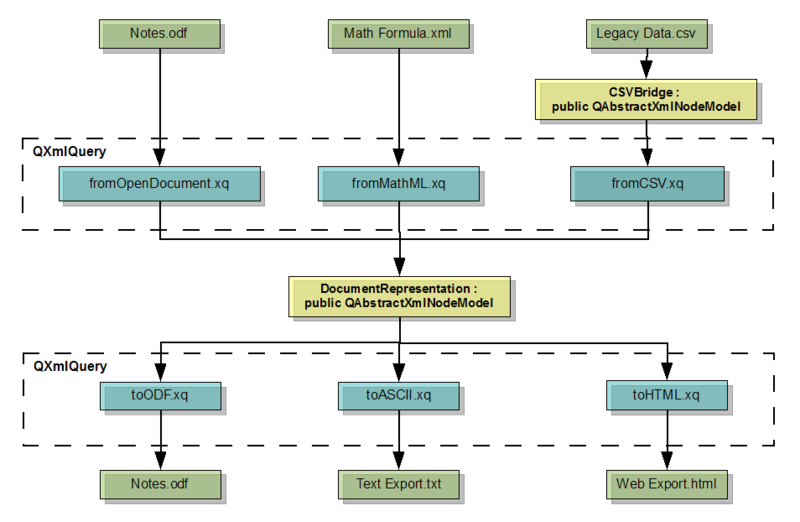 A QObject hierarchy, as seen in the QObject XML Model example. Subclassing QAbstractXmlNodeModel to let the query engine access non-XML data by the same API it uses for XML is the feature that enables QtXmlPatterns to query non-XML data with XQuery. It allows XQuery to be used as a mapping layer between different non-XML node models or between a non-XML node model and the built-in XML node model. Once the subclass(es) of QAbstractXmlNodeModel have been written, XQuery can be used to select a set of elements from one node model, transform the selected elements, and then write them out, either as XML using QXmlQuery::evaluateTo() and QXmlSerializer, or as some other format using a subclass of QAbstractXmlReceiver. Consider a word processor application that must import and export data in several different formats. Rather than writing a lot of C++ code to convert each input format to an intermediate form, and more C++ code to convert the intermediate form back to each output format, one can implement a solution based on QtXmlPatterns that uses simple XQueries to transform each XML or non-XML format (e.g. MathFormula.xml below) to the intermediate form (e.g. the DocumentRepresentation node model class below), and more simple XQueries to transform the intermediate form back to each XML or non-XML format. The articles Avoid the dangers of XPath injection, Robi Sen and Blind XPath Injection, Amit Klein discuss the XQuery code injection problem in more detail. Applications using QtXmlPatterns are subject to the same software limits as any other system. Generally, these can not be checked. This means QtXmlPatterns does not prevent rogue queries from consuming too many resources. For example, a query could take too much time to execute, or could attempt to transfer too much data. Or a query could cause an unreasonable amount of recursion, which could crash the system. XQueries can do these things accidentally, but they can also be meant as deliberate, denial of service attacks. Since XPath 2.0 is a subset of XQuery 1.0, it is supported. Processing of XML files supports xml:id. In practice, this allows elements that have an attribute named xml:id to be looked up efficiently with the fn:id() function. See xml:id Version 1.0 for details. data The bytes are encoded in the URI itself. For instance, data:application/xml,%3Ce%2F%3E is <e/>.